Fans of THE AMERICAN ASTRONAUT will not want to miss this triple-treat evening! Director/Musician/Actor Cory McAbee comes back to Boulder to introduce his latest film: STINGRAY SAM. 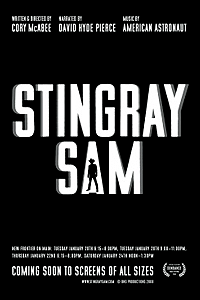 Conceived as six webisodes for screens of all sizes, STINGRAY SAM premiered at the last Sundance Film Festival to great acclaim and we are now proud to bring you the Colorado premiere. What to expect? More interstellar space travel, more song, more dance, and more slap-happy, secret-handshakey, totally inventive fun. Cory will introduce STINGRAY SAM at 7pm, and after that we are going to screen a brand-spanking-new 35mm print of THE AMERICAN ASTRONAUT. How new is it? It’s still wrapped in plastic and will get its very first screening tonight. Why is that important? The previous five existing prints were loved to death as they circuited around the world and were all scratched up. And, let’s face it, the DVD simply never did justice to the beauty of the black-and-white cinematography of McAbee’s poetic vision. So we commissioned BNS Productions to make a new print, and with the help from our friends at Norlin, we were able to acquire this new print as part of our permanent collection. (THE AMERICAN ASTRONAUT is regularly used in film classes as an example of how artistic ingenuity can reinvent traditional narratives.) To top everything off: Cory will be on-hand at the end of this for a spirited Q&A. Stingray Sam is a cleverly made loving tribute to the serials of old (be they "cowboy" or "spaceman" ones), and a darnn funny one too. It's short, but sweet. Kindhearted ex-robber Stingray Sam is trying to go straight. He hides from the law, working as a singer-slash-bouncer in a seedy nightclub on Mars, but the planetary economy is in decline and life is hard. Then, one day, his old pal The Quasar Kid shows up with an offer Sam cannot refuse: on a planet far, far away, a little girl is kept prisoner by an insane plutocrat. And if Stingray Sam and The Quasar Kid rescue her, their criminal records will be wiped! Soon, these two space cowboys set out on what may be their most difficult adventure yet... Few films have me chuckling from beginning till end, but this one managed to do it. Well, except when I was laughing. The Fifties' serial look has been recreated with obvious love, and the stark black and white photography really helps in selling it. The unique sparse sets and designs show genuine creativity and don't feel like they've been caused by a low budget. Information storage (for example) is done with bulky cumbersome devices, interfaced only through ancient coiled cables and huge plugs. Yet this is exactly what might look like science fiction in the Fifties, and this is used consistently throughout the film to set up some great jokes. Some of the plays on well-known science fiction tropes are also very witty indeed, and even during the most ridiculous parts of the story some dry sarcasm can be felt. Exposition is often handled through paper-collage animations which (if anything) resemble Terry Gilliam's work for the Monty Python's television series. As opposed to the normal narrative, these parts are actually in color, yet instead of creating a design-clash these make the whole experience of watching an even more pleasurable one. Don't be deceived by its cheap looks or stunning black-and-white-o-vision, Cory McAbee put more creativity and wit in his film than I've seen in ten movies twice its length and a hundred times its budget.